"Uh-oh, I think I might have AEFW..." I saw this statement several years ago. I wasn't too concerned, and thought it wasn't a big deal. 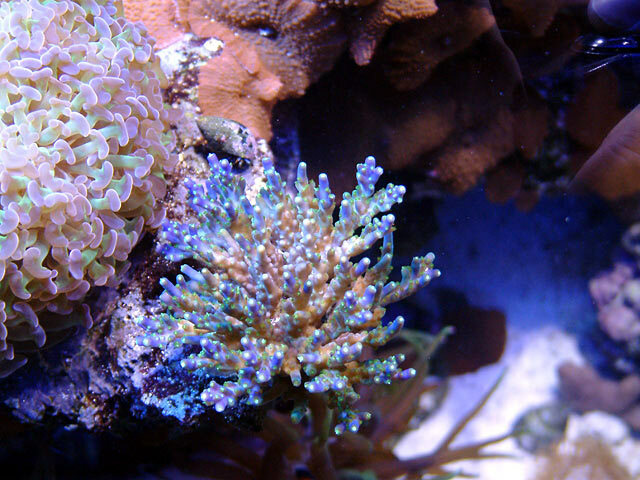 Later, I discovered my favorite SPS coral was fading fast, the color literally leaving the coral more and more daily. Staring at the coral, nothing looked wrong with it other than it being faded. It was polyped out, and seemed to grow at the regular pace. Still, I was concerned. Looking online for help, I found a simple test: Take the coral, place it in a white bowl and fill it up with water from your reef. Add a few drops of Lugol's Solution, stir and wait about a minute. Next, use a turkey baster to blast the coral with a few jets of water, and see what blows off or out of the coral. 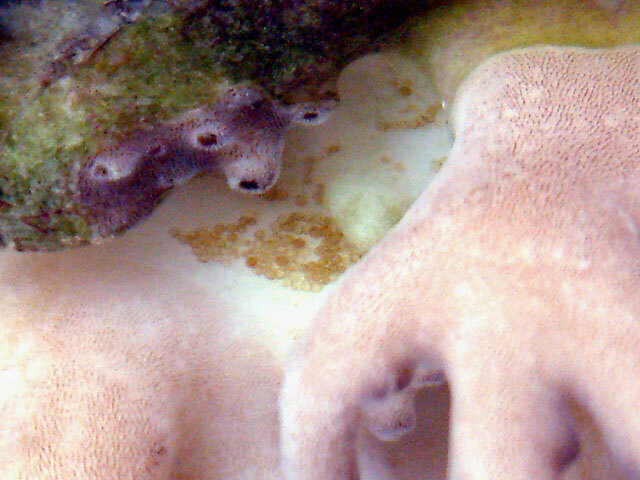 If you see flat oval disks coming out of the coral, it is most likely infested with Acropora-eating flatworms (AEFW for short). Their latin name is Amakusaplana acroporae. 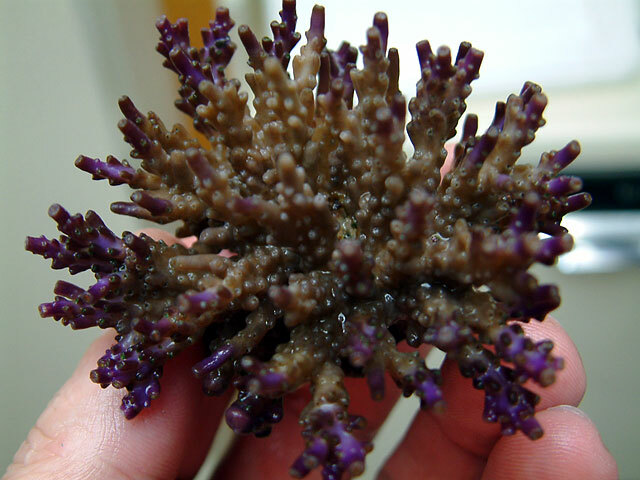 AEFW only affect Acropora sp., not any other kind of coral. 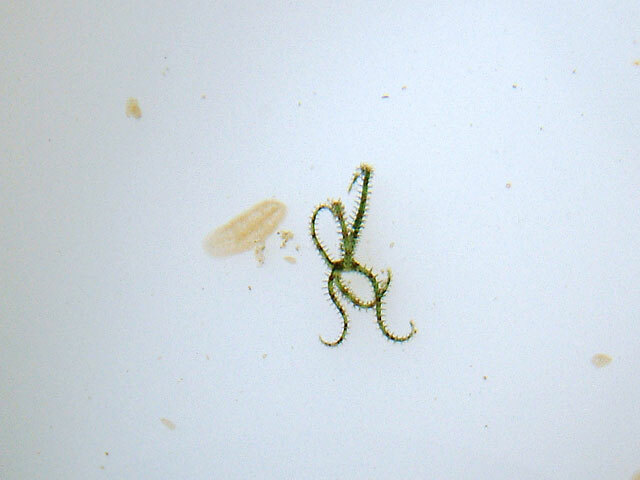 These are not like Red Planaria, nor like the mollusk-eating kind that we come across from time to time. These are truly invisible. Here is the coral, happy and healthy. And what it looked like when I decided action was necessary. Note the oval bite marks. I conducted the test as outlined above, and this is what I discovered. This is a large one, approx. 3/8" long. A few next to a baby serpent starfish. 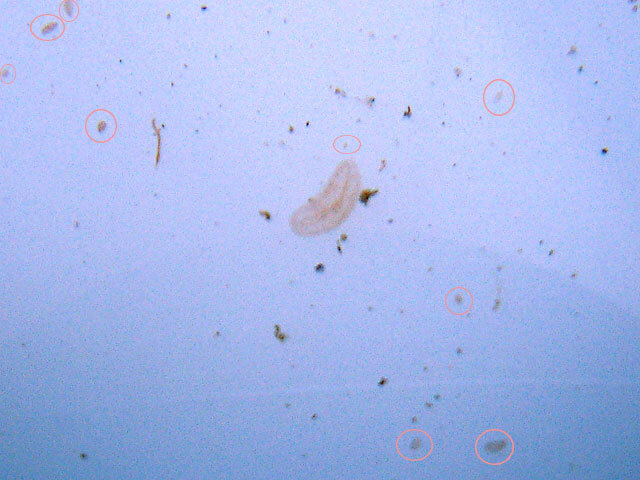 The tiny ones are circled to help you realize how small they can get. On the base of the coral, I found these eggs maturing. For a sense of scale, a penny was placed in the frame. This one was 3mm long. The problem I've discovered is you simply can not see them on the coral itself in your tank. At least not in a tank of my size. The core of this coral is severely affected. Only the perimeter still retains some color. Action is mandatory. For the most part, those that have lived through this infestation have set up a separate hospital tank with all the proper gear for flow, lighting, and stability. 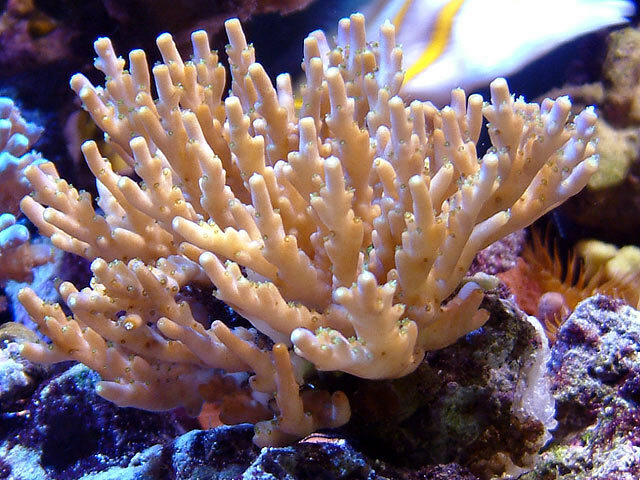 It is recommended that all Acropora sp. be removed from the reef for six weeks or more, and this includes any encrusting acropora that is still on the rockwork once the corals have been pulled out. The theory, as it stands now, is that you need to remove the corals that are infested with AEFW. Treating the corals outside of the tank, these flatworms can be killed and removed. 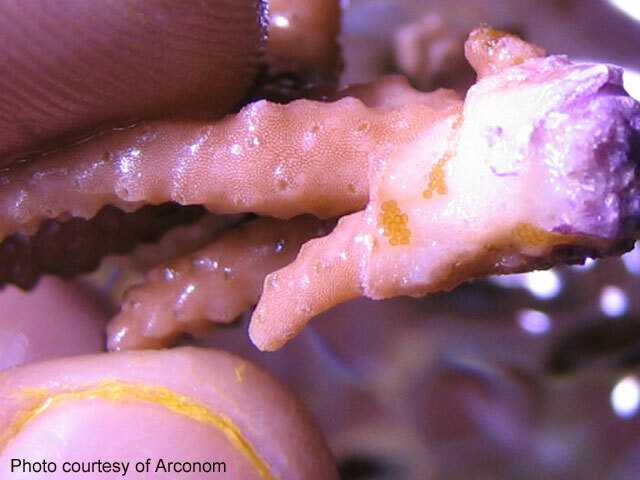 Any eggs on the corals or in your reef tank need to hatch before they too can be eliminated. I've been reading and discussing the procedure with others online, to better understand how others have tried and succeeded. If you would like to read the thread, you'll find more images, ideas, and opinions. The foremost method recommended thus far is to set up a separate tank, and place all Acropora sp. in there. Use water from the reef for the new system, so the corals aren't shocked even further. It's bad enough that they have to be handled and broken off of the rockwork, and placed into a new system with different flow. 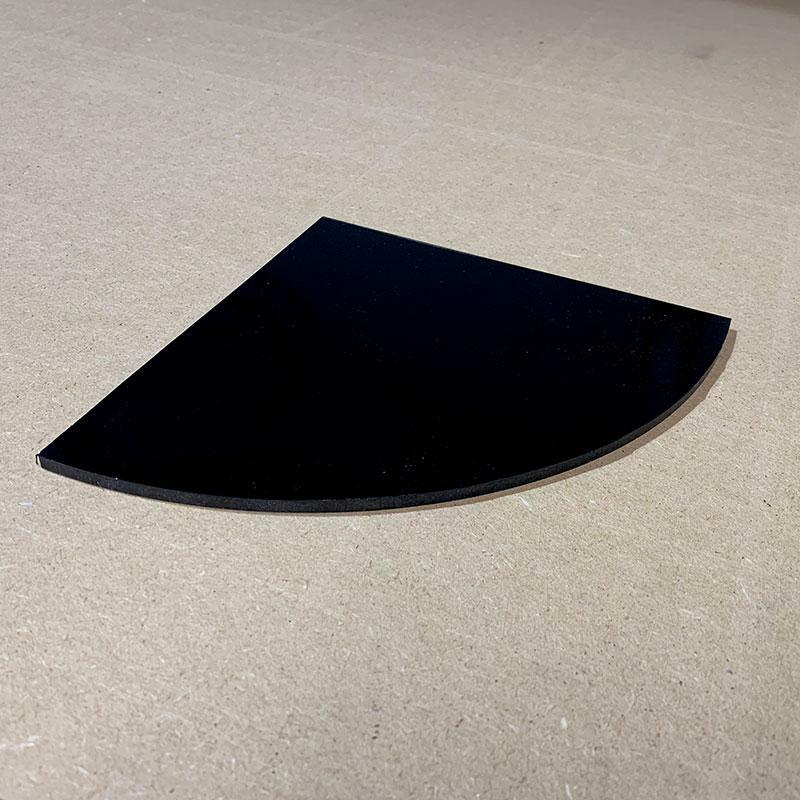 Once a week, the system should be treated with Levamisole (which is pig de+wormer and available at Tractor & Feed Supply or from a local vet). After a specific period of time, which appears to be 5 to 7 hours, each coral should be carefully blasted off with a small powerhead. 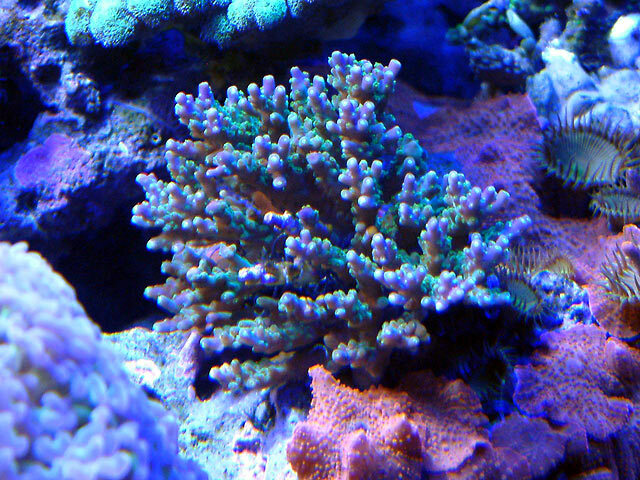 I would say a softer powerhead, not one that will rip tissue off the coral. Next, the coral should be inspected very very closely for any eggs. If you see them in the core, they should be scraped off with a dental tool or toothpick, and the coral is ready to be placed into a new setup for the next week. Working carefully, each coral should be handled the same way. Remember, if you have many corals to treat, keep in mind how long each one is in the solution. The first coral into the tank will be in longer than the last one, and while you baste each one clean, others are still waiting. If your goal is to keep them bathing for 5 hours total, and you spent two hours picking the first group clean, the others may end up sitting in solution for 7 hours or more. Try to keep track of time. By having two separate tanks, it allows the hobbyist to dispose of the medicine-laden water and wipe down the system of any stragglers. There's no point putting "cleansed" corals back into a tank full of AEFW. 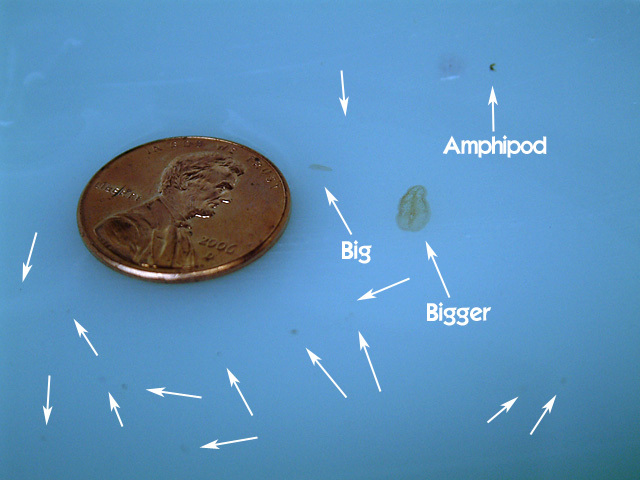 In the meantime, any AEFW that may be in the reef tank will have hatched, usually within 15 days of being laid. 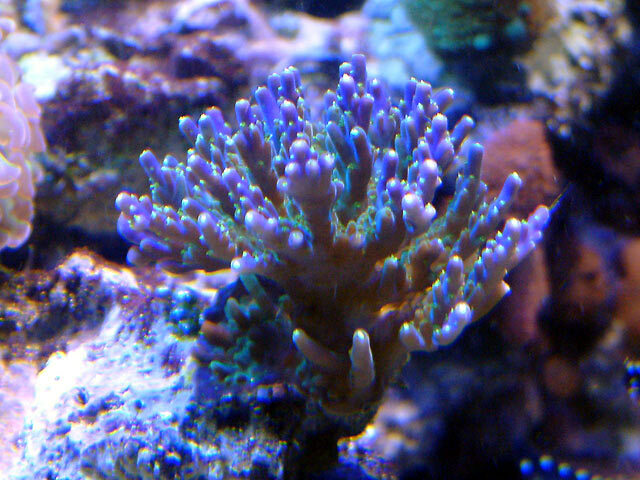 When they emerge, their first desire is to eat Acropora sp. The idea is if they can't find any acropora to eat within an estimated five days, they'll perish. So keeping your reef acro-free for 6 weeks is the best way to kill off any potential predators. The corals that are being hospitalized need to be treated weekly. Hopefully after six weeks of killing every generation that crops up, they will all be terminated, and the corals can finally be placed back in the reef. Yes. In my experience, any SPS that is moved from one spot to another in my tank react badly. Now imagine moving them from their home to a different tank entirely, adding a foreign substance (medicine), different flow, different proximity to other acropora, and different lighting (now they are all at the same height and distance from the bulb, unlike your tank), plus they are being handled weekly! I couldn't begin to guess the losses you may incur, but leaving the corals untreated means they'll die, and that wave of death can move through your reef like a wildfire as the AEFW population grows exponentially. While I'd prefer to just ignore it and hope it'll go away, I don't believe this is a viable option. It has been stated that you should expect 20% losses when treating with Levamisole. Reports vary, some experiencing higher losses, others less. 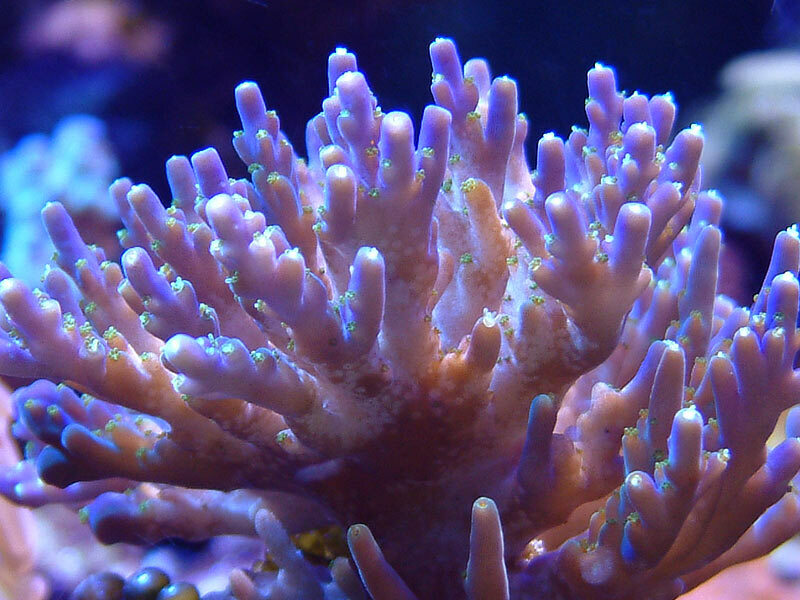 Keep in mind that leaving the corals in the tank untreated, you'll end up losing them all. I think it is better to save what you can, doing your best as a reefkeeper. One person suggests that if the coral has too many eggs in the core and you are unable to get them scraped out, just dispose of it entirely. 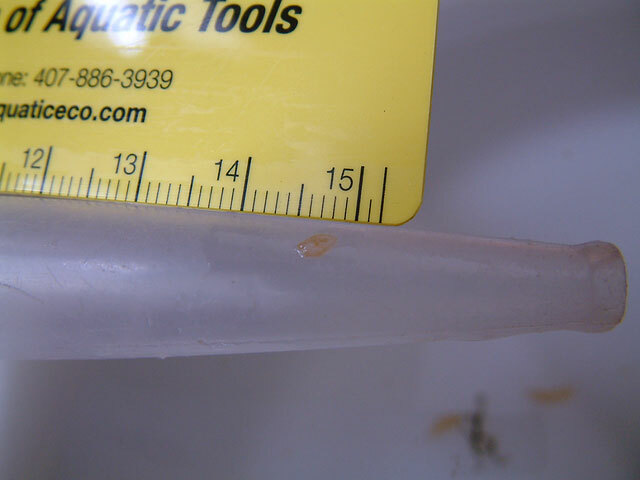 Once I discovered that my Tyree frag (pictured above) was infested, I opted to try the Betadine treatment. Betadine is available at Walmart, and costs $12. They have a generic version for $5, but it was out of stock. 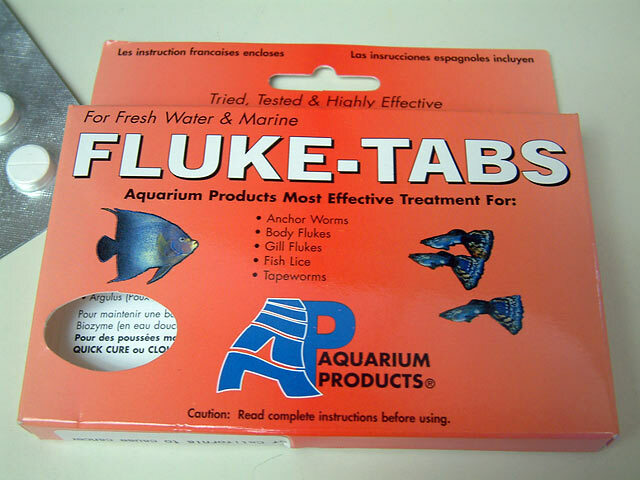 It has the same active ingredient, so if you can get it, it should be fine. 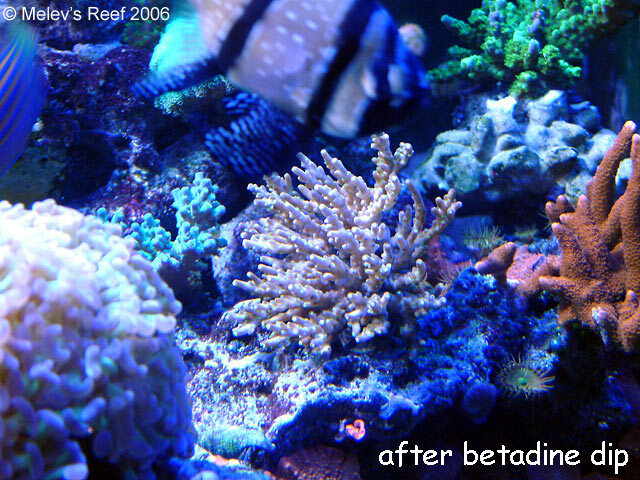 Mix up one liter of tank water with 3 ml of Betadine, and place the coral in that solution for 25 minutes. After the timer went off, I blew off the coral with a turkey baster, sending tons of flatworms into suspension and off the coral. I inspected the coral for eggs, and scraped off every last one I could find. Next, the coral was rinsed in some tank water, basted repeatedly to remove any more stragglers, and finally put back in my tank. 8/11/06 - still untreated, but obviously losing color. 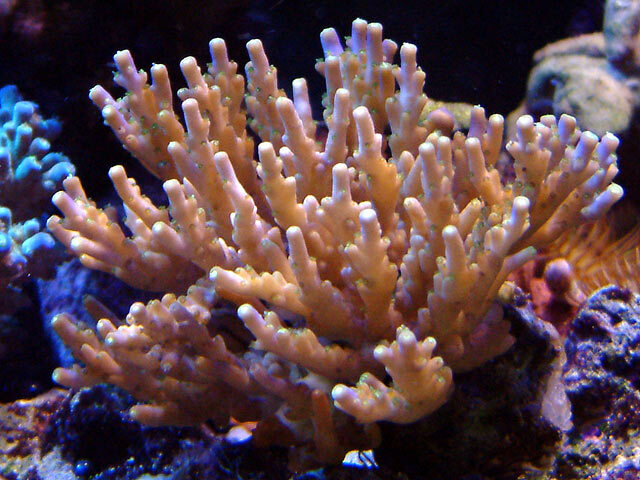 8/22/06 - polyps are showing! On 8/29/06, I dipped the A. valida a second time in the Betadine solution just to see if any AEFW existed, and another 50 flatworms blew off - much to my shock! I also pulled out another tri-color acro and a A. secale, and they too were infested with AEFW. My 280g reef has 25 Acropora pieces that will have to be pulled and treated in a separate system. With MACNA a few weeks away, I'm not going to do anything until I get back. Just before MACNA during the month of September, I treated the coral with Fluke tabs instead of Betadine. The product works at getting the AEFW to let go, which I turkey basted off the coral in the treatment tank. I used two tablets in two gallons of water, and put a powerhead in the solution to keep the product in suspension. It looks like snow in the medicated water, and will settle on the coral. This caused no harm at all. After about 20 minutes in this solution, I blew off the coral again, took it out of the treatment tank and dumped out the water. This was replaced with tank water, and the coral was put in that for another 20 minute bath to remove any toxins and to observe for any stragglers. Over the next few years, I had a couple of tanks spring leaks, and the last of this coral is gone. It was one I kept track of, with special interest. About once a year, AEFWs would crop up in my reef, but as soon as I noticed I began my method of blowing off the affected corals with a powerhead. As the flatworms blew off into the water column, the Lyretail Anthias were quick to gobble them up, then wait for the next one to blast loose. We had a good method, working together to reduce their population. Another viable method is to pump RO water over the corals in question while still secured in the reef tank. The freshwater would immediately affect the AEFW, and they would peel off the coral's branches and float into the current for the fish to devour. We still need a better more permanent solution, but for now we have to keep our eyes open and act when they make their presence known.